This year’s economic indicators are not doing much to bolster confidence so far. The World Bank cut its growth forecast. China is pouring hundreds of billions of dollars into its slowing economy. Apple’s downgraded sales forecast, which led to a market sell-off, was just one of several warnings from major companies. This week, several large banks announce their earnings, along with the likes of Netflix, UnitedHealth and Delta Air Lines. Yesterday, Citigroup reported quarterly revenue of almost half a billion dollars less than analysts had expected, saying economic uncertainty had hurt its trading business. The China factor: Companies seen as particularly vulnerable to a Chinese slowdown include Starbucks and, after passenger vehicle sales fell there for the first time in 28 years, Ford and General Motors. Alibaba’s president, Michael Evans, told a retail industry gathering yesterday that “China has slowed down,” blaming “natural causes” and trade tensions with the U.S.
A helping hand from Beijing: Chinese officials said today that tax reductions on a “larger scale” were coming, following cuts for major industries and in personal income taxes. It also announced a cut for small companies. Britain’s Brexit vote: Prime Minister Theresa May puts her plan for withdrawing from the E.U. before Parliament later today, less than 75 days before exit would happen automatically. She is widely expected to lose, possibly by a wide margin, which could expose her to a no-confidence vote. European stocks opened higher, and market watchers are bracing for volatility after the vote, but Britons don’t seem that worried yet. Pacific Gas and Electric Company, the California utility that has been in financial crisis after deadly wildfires in the state, said yesterday that it would file for Chapter 11 bankruptcy protection by the end of the month. The company said its liability for damages from the wildfires could reach $30 billion, report the NYT’s Ivan Penn, Thomas Fuller and Lisa Friedman. The bankruptcy announcement, made in a regulatory filing, pushed the company’s shares down more than 50 percent and posed a challenge for state regulators, who will have to decide whether to raise electricity rates. 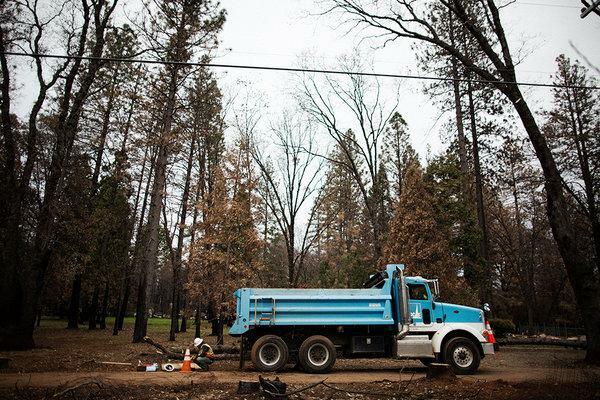 The utility’s woes could be just part of a wider economic toll from climate change, which is fueling wildfires nationwide. The quick take: Lights will stay on, but power bills are likely to increase. Wildfire victims may have to accept smaller settlements. And California may find it harder to reach ambitious climate change goals. Market fallout: Investors have long considered utilities a safe bet, so this is a reminder that volatility can strike any industry. Shareholders could be wiped out and bondholders could take a hit. A complex bet: The P.G.&E. stock held by the Baupost Group, the hedge fund run by Seth Klarman, is part of a bigger wager on the utility. Baupost also bought $1 billion of legal claims that an insurer held against it. President Trump has repeatedly spoken of a revival in the American steel industry, crediting his trade policies. Stock prices for some of the nation’s biggest steel manufacturers dropped by as much as 47 percent in 2018 amid fears of slowing global economic growth and the potential for Mr. Trump to reach trade deals that remove the tariffs. The industry’s best hope would be major infrastructure legislation, which looks increasingly unlikely. More: President Trump said yesterday that tariffs had put pressure on China’s weakening economy, but trade talks between the two nations have yielded little. President Trump spent a snowy weekend cooped up in the White House, serving fast food to the Clemson Tigers and not giving in to proposals to end the government shutdown. Yesterday, he rejected a suggestion by Senator Lindsey Graham of South Carolina to restart operations for three weeks while negotiating. Mr. Trump wants $5.7 billion for a wall along the border with Mexico, where his repeated references to a “crisis” have not always reflected reality. His supporters remain behind him, even in areas where the federal government is a major employer and even as polls show that most Americans blame Mr. Trump and Republicans for the shutdown. • The shutdown is a further blow to farmers already hurt by the U.S.-China trade war, the head of the USA Dry Pea & Lentil Council told CNBC. President Trump addressed the Farm Bureau at its annual convention in New Orleans yesterday, urging farmers to look past short-term pain.